Florida Statute 316.075 is very clear: (c)(1) Vehicular traffic facing a steady red signal shall stop before entering the crosswalk on the near side of the intersection or, if none, then before entering the intersection and shall remain standing until a green indication is shown. The law in Florida is crystal clear, and it applies uniformly to all vehicles, with the exception of emergency vehicles, such as an ambulance, a police car or a firetruck, provided that they are using their emergency lights and sirens. 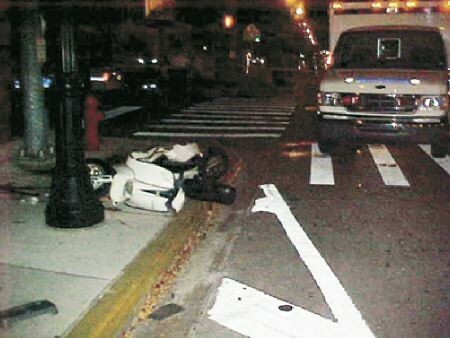 On a winter night in Key West, Stuart Kemp was riding his scooter in the streets of Key West. He approached an intersection, and having the green light, he proceeded to cross the intersection. That is when, in a split second, a vehicle coming out of nowhere hit him on the side, and Stuart was thrown into a cement wall, seriously injured. The vehicle that hit him was an ambulance. At trial, the driver of the ambulance claimed that he was on an emergency transport and therefore had the right of way. The evidence however showed that the driver did not have his emergency lights turned on, nor his emergency siren sounding. Without warning to the public of an emergency, Stuart kemp had no reason to believe that a speeding ambulance was going to run a red light, let alone crash into him. After a nine-day trial, both the ambulance driver, who failed to turn on the vehicle’s emergency lights and siren, and the ambulance company were found negligent in the incident. The plaintiff, who was passing through a green light, was not at fault in the accident, the jury decided, while unanimously awarding a $2.1 million verdict to the plaintiff after three hours of deliberation. As a result of this catastrophic collision, Stuart Kemp was permanently injured and disfigured. “When he was hit, his face went into the side of the wall. It broke all the bones in the side of his face,” said Ira Leesfield, Stuart Kemp’s attorney. The accident knocked out his front teeth and gums, and also fractured Kemp’s back in three places, crushing 75 percent of one vertebrae, Leesfield said. Stuart Kemp was airlifted to Jackson Memorial hospital in Miami where he stayed for 12 days. Key West rallied around Kemp, who is an owner of Nine One Five on Duval Street, and raised money for his $123,053 in medical expenses. Senior Managing Partner Ira Leesfield, and Partners Tom Scolaro and Patricia Kennedy represented Mr. Kemp who can now obtain the medical treatment necessary to restore his back and face. Personal Injury Lawyers at Leesfield Scolaro have been litigating and resolving cases in Key West on behalf of injured victims for almost forty years. Whether a person is injured in a car accident, while riding a scooter or a scooter, the Leesfield Scolaro Attorneys will take on your case and look to obtain justice. If you or someone you know was involved in an incident resulting in physical injuries caused by the negligence of another, contact our Key West office at 1-800-836-6400 and we will begin working on your case immediately. Visit our website for more information by clicking here.